From right: The Secretary-General of the ARF Mr Andrew Harding; The HKJC Chairman Mr T Brian Stevenson; New ARF Chairman Mr Winfried Engelbrecht-Bresges and Chairman of the Turf Authority of India Mr Vivek Jain, at the ARF flag handover ceremony. Mr Stevenson added: “There has been a very real sense that this week's presentations have been geared towards material that has real practical applicability across the range of countries who are represented here. “Greater international collaboration is clearly a must for the racing industry to maintain its competitiveness and popular appeal in the face of so many other competing forms of gaming and entertainment today. I believe we can achieve that,” he said. On behalf of the host city and the Hong Kong Jockey Club, Mr Stevenson thanked everyone for their attendance, their support and their contributions to the success of this event. Those present then enjoyed an evening of entertainment, featuring an exciting mix of music, dance and acrobatics. Also at tonight’s event, Mr Andrew Harding, Secretary-General of the ARF, announced that Hong Kong Jockey Club CEO Mr Winfried Engelbrecht-Bresges will succeed Dr Sato as Chairman of the organisation. Taking up the role as Chairman of the ARF, this will be a second term of office for Mr Engelbrecht-Bresges, who was previously ARF Chairman from 2007 to 2009. His term begins with immediate effect. Mr Engelbrecht-Bresges is also Vice-Chairman of the International Federation of Horseracing Authorities. 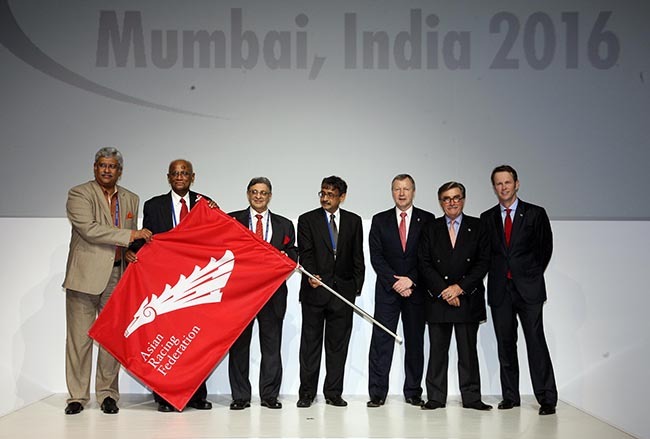 The final act of the 35th ARC was the official handover of the Asian Racing Federation flag to the host of the 36th ARC, India, which will hold the event in Mumbai in early 2016.